Do any of these dreadful products spark desire deep within you? That's weird, but I don't judge. If you truly want to buy something from here email me at ryannickum@gmail.com and we can make it happen. No doubt, you've unintentionally disappointed your dad in countless ways over the years. 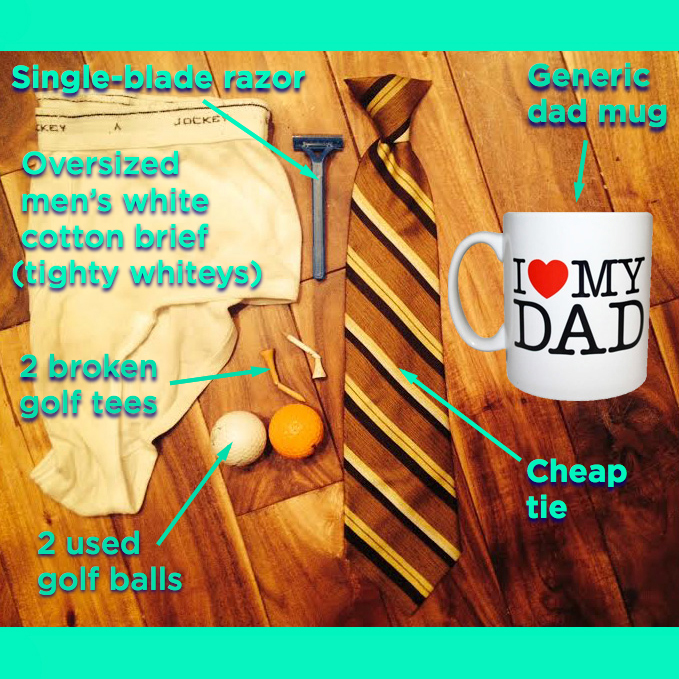 This time, why not disappoint him intentionally with the worst gift for a dad currently on the market? This gift basket chock-full of disappointment makes the perfect gift for Father's Day, birthdays, or any holiday requiring a gift. Does it come with an ugly tie he'll hide in the glove box whenever he leaves home? Check. Oversized white cotton briefs to wander the house in? Yep. A stupid mug he'll be embarrassed to use at work? Got it. A single-blade razor that will triple his shave time? It's in there. Broken golf tees and scuzzy old golf balls? Those thoughtless additions are included as well. Do you have a nickname you hate, or worse yet, no nickname at all? Do you long for the validation that a nickname brings? I am here for you. I create perfect nicknames for any individual for $99. And if you're feeling solid about your nickname, I'd be happy to provide a nickname for your friend, your mom, or each and every member of that uncoordinated mess you call a softball team. This is simple. You give me cash and I give an unexpected and life-affirming nickname that will be loved.